There’s no shortage of reasons to go paperless, the most obvious of which is that it’s proven to save time and money in nearly countless ways; however, if you don’t go about making the switch methodically and carefully, it could backfire and end up costing you more than it saves you. 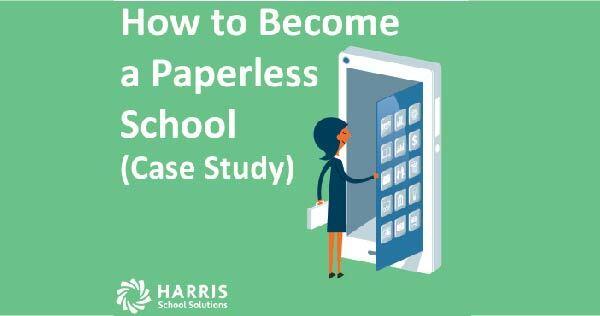 Using as an example Southwest Preparatory School District (SWP), a Harris School Solutions client and charter in San Antonio that has successfully integrated a number of paperless systems, let’s look at the smart way to go about the process. Step 1 – What’s your goal? First, you need to begin with the end in mind. If you don’t, your decisions throughout the process will be arbitrary. Reduce administrative expenses while increasing efficiency. Step 2 – Reverse engineer the plan and proceed in phases. The loftier your goals, the more time it takes to move the needle. Don’t rush. Instead, figure out which changes you need to make to reach your goal, and then segment them into phases. 2017 – Continue to explore additional opportunities to integrate technology solutions with SIS (time and attendance and the Child Nutrition program) while consolidating providers. Step 3 – Do your due diligence. In each phase, you will have considerations to make that are unique to that phase. Some, like when to implement, will be part of each phase. Others, though, will apply only to a particular phase. For the electronic storage phase, for example, how will you handle your existing records? For digital time and attendance, on the other hand, how comfortable will your teachers be with the new system? The best way to approach each phase is to create a new list of considerations. The first phase is the most important, since it will dictate what you can do in all the other phases. SWP, for example, switched as many software vendors as possible to one provider. Develop a committee to review potential providers and make final selections. Schedule presentations with each solution provider. How will we handle data transfers? What level of security can they provide? Can they meet our charter’s specialized needs? It’s particularly important to bring in all relevant stakeholders in each phase so that you can look at the transition from every side and avoid missing any key considerations. Once you implement one phase, start planning for the next. When you’ve reached your goal (going paperless), set a new technology goal. Keep optimizing and you’ll be surprised at how far you can take your school. This isn’t to say SWP has shrunk. The exact opposite has happened, in fact. During this transition to paperless systems alone, SWP added two more campuses and expanded several others. What began as a small charter school with just 23 students now serves 800 students across 6 schools. It’s precisely because they are so efficient that they’ve been able to grow. Considering going paperless and saving your school money? Click below to speak with us today.